Ready to start changing lives? Become an internationally certified Personal Trainer - Change your life, help others change theirs! “I’m a thousand times more confident than when I signed up!” - Phillip Quilter, Norway I want to help others change their lives - show me more! Stuck in that grey job, dreaming of a more fulfilling career? Get qualified as a Personal Trainer in the sun with EPTI! Start your journey right now with our online e-learning platform, followed by two weeks of practical learning and assessment at one of our Training Campuses in the Mediterranean sun! “I chose EPTI because all the other companies are driven to recruiting as many people as they can. This course is run by personal trainers & has a personal touch” – Paul Last, UK I want to begin a more fulfilling career - how do I start? Connect with your passion and join the EPTI family! Join energetic, like-minded individuals and become certified as a Personal Trainer with EPTI. EPTI courses are kept small, with a high instructor: student ratio and experienced and dedicated tutors to keep you motivated and inspired as you progress towards your worldwide-recognised certifications. “This feels as how school should have been… this is how learning should be!” - James Bone, Spain I’d like more information to get certified - please advise me. We are one of the very few personal trainer courses that afford their students the opportunity to train REAL clients as part of their learning experience, as opposed to them just practising practical skills on fellow students. Get certified as a Personal Trainer with EPTI and work anywhere in the world! The European Personal Training Institute is recognised by CIMSPA & REPS in the UK, and recognised by ICREPS – allowing EPTI students to work world-wide. Our courses blend home-based online study and coursework (supported by your personal tutor), with practical learning, mentoring, and assessment at one of our 3 Mediterranean training campuses. It’s easy, and you can start right now! Just like a great personal trainer, a great training provider should be personal! Regardless of your learning style, current experience, and confidence level, EPTI will build you up to beyond the required industry standards. EPTI provides additional in-house manuals and video lessons, alongside the standard manual, so you will learn and understand all of the materials in a way that fits you personally. Your support tutor will be introduced to you upon enrolment, and will always be on hand to provide detailed feedback to ensure complete understanding as you progress through your online study and coursework. During the practical portion, experienced fitness industry professionals will teach and mentor you to ensure correct technique, full understanding, confidence, and comfort with your newly acquired knowledge and skills. Throughout every step of your education, EPTI tutors will be there to guide and assist you on your journey to becoming an exceptional personal trainer. 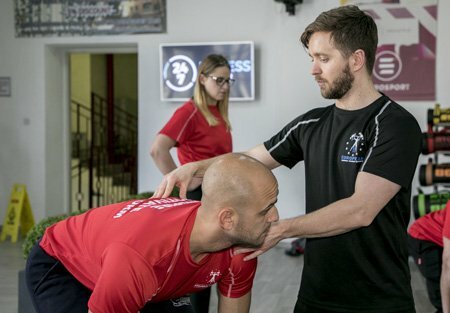 EPTI has partnerships with multiple training facilities around Southern Europe, selected to provide an ideal learning environment for you to focus on mastering all practical aspects of becoming a personal trainer. Course & accommodation packages are additionally available at both our Dénia and Estepona campuses in Spain. The Dénia apartment complex is located less than 200 metres from the beautiful sandy beaches of the Costa Blanca. 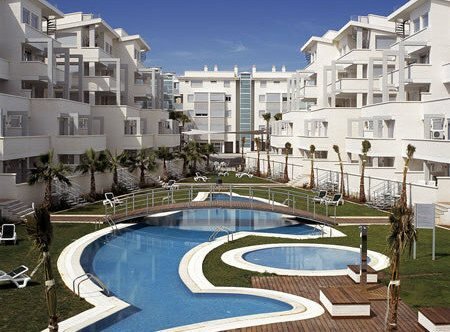 The Apartment complex at our Estepona campus is located close to both the towns of Estepona and Marbella and the golden beaches of the Costa del Sol. 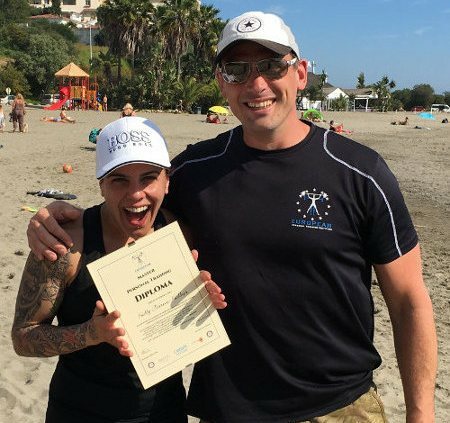 EPTI chose the fantastic year-round warm climate of Southern Europe to allow outdoor training sessions where you will hone your outdoor personal training skills in the open air and on one of many beautiful beaches. The added enjoyment and relaxation of the natural environment will enable you to focus on learning everything you need to be an effective and in-demand personal trainer. If you want to become a personal trainer – learn from a successful personal trainer! Our passionate team are experienced UK and international PTs running their own successful businesses, training clients every day. EPTI coaches have wide-ranging academic qualifications and specialisations, ensuring that you gain the knowledge, experience, and confidence needed to succeed in today’s fitness industry. Only EPTI provides this unique opportunity to train real people (rather than just role-play with classmates) in the unique EPTI PT Clinic. You will graduate with real experience of training members of the public, along with all the tools and confidence ready to take on clients immediately... and produce powerful results for them. This authentic personal training experience is one of the most invaluable aspects of training with EPTI… and one that very few training providers offer their students. So now you’re a certified PT. Great! Are you ready to start your own business? EPTI’s complementary PT Business Supremacy course details exactly how to start making money as a personal trainer – as soon as you graduate! The course draws together the extensive experience of the EPTI team professionals who have already been there. All the years of trial and error, assessing what works and what does not, all the tips and tricks, branding, marketing, and more. Only EPTI provides complete support from beginning to end… and beyond! Check out our social media or testimonials pages to see why other students loved EPTI! EPTI HAVE ALL THE QUALIFICATIONS YOU NEED TO BECOME A WORLDWIDE CERTIFIED TRAINER! Follow your passion and start doing something you truly love! The EPTI PT Clinic gives you the unique opportunity to train real people, instead of just role-playing with classmates. You will connect with a real gym member from our campus gym, and then program and deliver a real PT session for them personally.